Below is our list of ice cream flavors that we currently serve in our ice cream shop in Milford, CT.
Come and try one...or two or three! All our ice cream, sorbets and many of our toppings are made in our kitchen. Our flavors change all the time and even through the flavor is listed it may not be in stock when you visit. We make small batches of ice cream so we may run out. We hope it’s an opportunity to try something different and find a new favorite. Banana Foster – Fresh banana cooked in brown sugar and butter with a bit of rum. Cantaloupe & Cucumber – Very refreshing! D-Cup – light chocolate cake batter with cupcakes. Morning Jolt – Coffee Ice Cream w/ chocolate covered bacon. 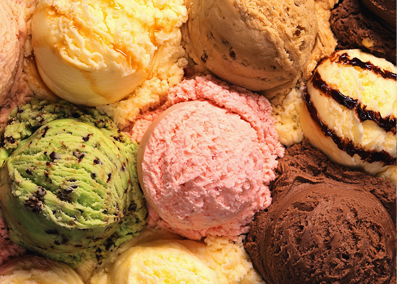 Ask us about our selection of no-sugar added ice creams! We also carry a selection of fresh fruit sorbets and other vegan options, Ice Cream Pops, and Ice Cream Sandwiches. HERBAL AND FRUIT INFUSED LEMONADES. FLAVORS CHANGE WEEKLY. All the ice cream is manufactured in a facility that handles nuts.